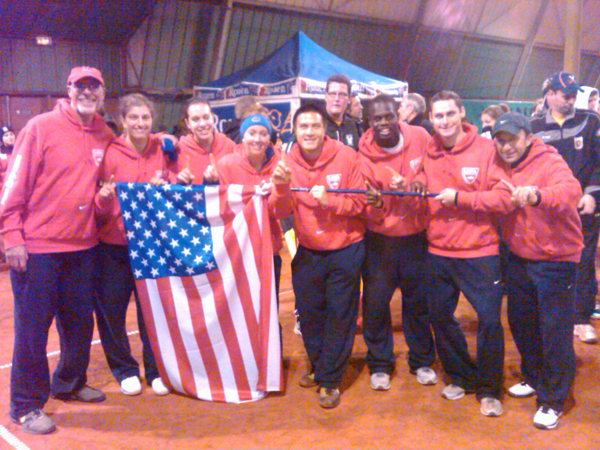 For the third straight year, the United States collegiate team faced France in the finals of the Master'U BNP Paribis. The U.S. took the lead by adding another title to go with the 2009 championship. This competition of college players from Belgium, China, Germany, Great Britain, Ireland, Spain and host city France is held each year over four days. It features a best of seven format in singles, doubles and mixed doubles. Representing the United States for the sixth annual event was Jacqueline Cako (sophomore, Arizona State), Beatrice Capra (freshman, Duke), Nelly Ciolkowski (junior, Clemson), Lauren Embree (junior, Florida), Jarmere Jenkins (junior, Virginia), Daniel Nguyen (senior, Southern California) and. Wil Spencer (senior, Georgia). University of Virginia coach Mark Guilbeau led the women and Boise State's Greg Patton coached the men. Despite the competition on unfamilar red clay, the second seeded United States team eliminated Germany (6-1) and shutout Belgium to earn a place in the finals against top seeded France. Once there they trailed 3-0 before Wil Spencer picked up the win that would hold them from elimination. It was Daniel Nguyen, who has clinched two NCAA Championships for the University of Southern California, in position to bring USA to a title and he did just that when he teamed with Jarmere Jenkins for men's doubles and then Jacqueline Cako for mixed doubles. For more on this event, visit the official website, the ITA Master'U BNP Parabis page, and the blog of the coaches and players.